This is a Prey character profile guide. 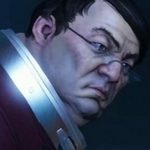 Here you will find details on Alex Yu, an important character in Prey. Alex Yu is the brother of Morgan Yu and the CEO of TranStar industries. Alex is responsible for transforming the TALOS-I space station into a pinnacle of scientific progress. You will first meet Alex after heading up to the roof. Alex compliments your transtar uniform, and gives you some support before calling you into the room to run some tests. When the sleeping gas knocks Morgan out, Alex wonders what happens to his sibling. Alex and Morgan have a very colored past. In one of his messages to Morgan, he mentions that they are gonna shake things up, “like old times,” which implies that they had a fulfilling partnership in the past. However, Alex’s intentions for Morgan are less than benevolent. Alex intends that Morgan should be a test subject to neuromods, allowing Morgan to perpetually repeat a single simulated day on TALOS-I as they do conduct tests for the first time. I don’t think he’s wearing the tracking bracelet, so his ID is useless for finding him.